White House’s Spokesman Slams Media over Coverage of Inauguration at First Briefing 5 out of 5 based on 2 ratings. 2 user reviews. Press secretary for the White House, Sean Spicer, accused media of false reporting about the number of Trump’s inauguration crowd. On Saturday, during the first briefing of the new US administration, press secretary for the White House, Sean Spicer, accused media of false reporting about the number of Trump’s inauguration crowd, which, reportedly, was much smaller than that of Obama’s. “This was the largest audience to ever witness an inauguration, period, both in person and around the world,” the press secretary said. The statement was made despite photos of the event, which clearly showed that some sections of the Mall, in particular, an area near the Smithsonian Institution Building and the west part of the Washington Monument, were not full with people. There also was sparse attendance along the parade route from the Capitol to the White House. However, Spicer said that some of the photos were “intentionally framed in a way” to minimize the crowd, but, at the same time, he did not provide any examples or evidence of his claims. They ended up being correct. There were a lot of reasons why the crowd was thin but it did fill up. There were protesters blocking entrances to the secure areas and that hadn’t happened before. The secret service was also doing more screening than before. I am wondering if the protesters blocking the entrances and the low crowd claims are a coordinated hit on Trump’s supposed legitimacy. I suspect TPTB knew the SS was going to delay people and add in protesters blocking, it created the magic photographic moment. Trump supporters probably work 60-80 hours a week, I doubt many have the leisure to attend the events. Here is an image, comparing 2009 and 2017, from the same viewpoint. I guess it depends what time of day the images were taken and of course, where the photographers were positioned. You should see the photos ITV (UK TV channel) used. It was completely empty and next to one, showing Obama with a full crowd. For some reason the UK media are completely freaking out, over who had the biggest crowd at an inauguration. You can actually see the steam coming out of their orifices. I suppose, if you like seeing a ‘true fake news’ journalist, in meltdown, it was well worth watching. 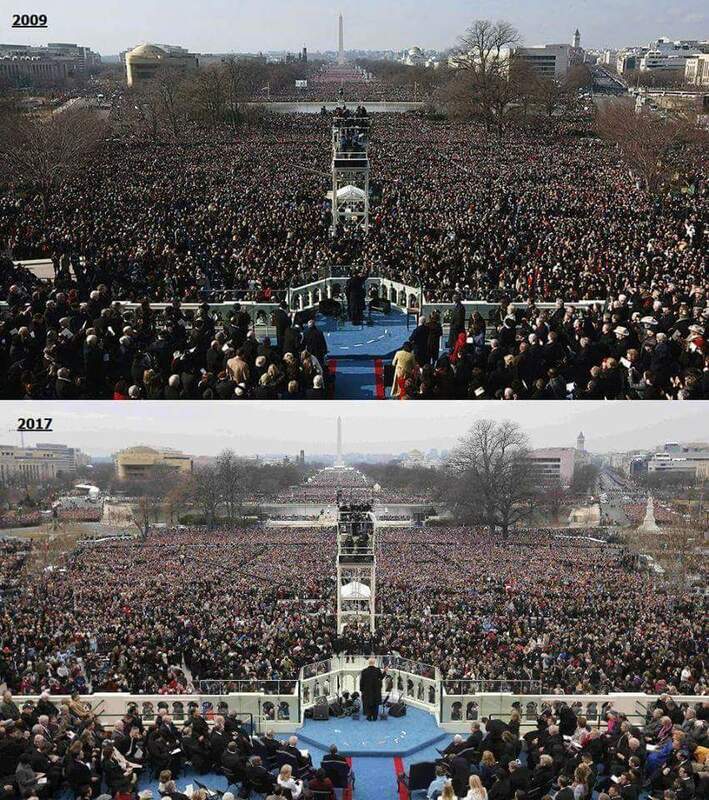 I’m sick of that image being shown around, it’s not accurate because it was taken at 8:40am – well before the crowd got to capacity. The MSM did the same thing during the Campaign, they would use selective angles to make Clinton’s rally’s look bigger and Trump’s smaller. Even though Trump has far more actual supporters than Hillary ever did, and most of her supporters voted ‘against’ Trump rather than ‘for’ her.